The Titans, Cyclops, Paul Bunyan, Pecos Bill, the Jolly Green Giant, or Jack's Beanstock Giant: all these characters bring to mind fictional “mythological” imaginings, but what about in actual literal Earth history? 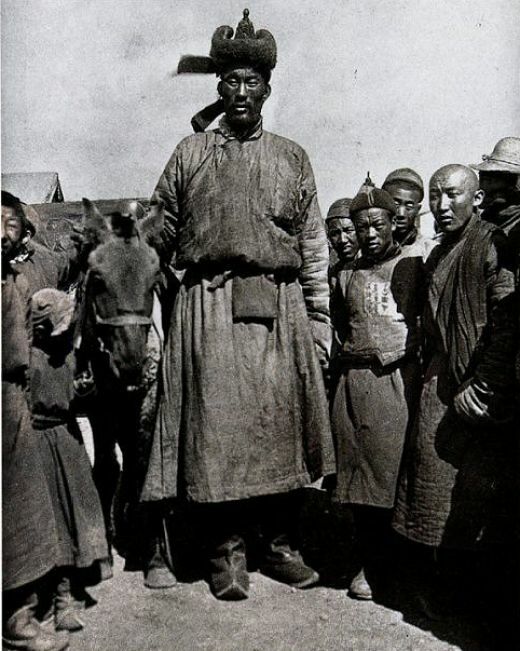 Many people assume these so-called “tall-tales” have no basis in fact, but is that true? From the Bible to Greek mythology, Native American legends to conquistador diaries, nursery rhymes to newspapers, from Josephus and Homer to modern day historical accounts and archeological finds, evidence of giant human beings living on Earth is abundant. The Execration Texts of Twelfth Dynasty Egypt (1900 B.C.) now on display at the Berlin Museum, mention by name the Anakim giants and Ashdod, the “city of the giants.” One of the most incredible accounts of ancient giants was by Hellenistic geographer Eumachus who told of two separate 36-foot human skeletons which were allegedly uncovered by Carthaginians somewhere around 300 B.C.! Roman author Pliny the Elder wrote that during the reign of Claudius (41-54 A.D.) a nine-foot nine-inch giant named Gabbaras was brought from Arabia to Rome and placed head of the Adiutrix legions. 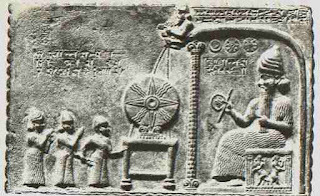 The area today called “Baqa” near the valley of Hinnom was long known as “Valley of the Raphaim” or “Valley of the Giants.” The Ras Shamra texts, discovered in 1928 in Syria, are historical documents mentioning the economy, history, and religion of Ras Shamra (ancient Ugarit) as well as the giant Rephaim which then inhabited the area. 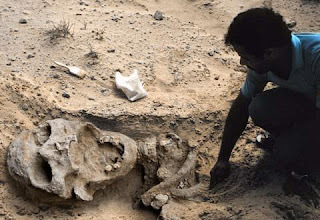 In 135 A.D. soon after the Bar Kochba war, Buber’s Tanhuma describes Roman Emperor Hadrian’s encounter with Rabbi Johnanan ben Zakkai’s in which he was shown the skeletons of fallen biblical “Amorites” measuring 18 cubits, or 30 feet tall! According to Jacques de Voragine, Saint Christopher, the Christian martyr “was of gigantic stature, had a terrifying mien, and was twelve coudees tall,” a coudee being slightly longer than a modern foot. Many early explorers including Vespucci, Drake, Coronada, De Soto and Narvaez all mention encountering giant human beings in their journeys. The first Europeans to sail along the Patagonian coast were Ferdinand Magellan and his crew in 1520. 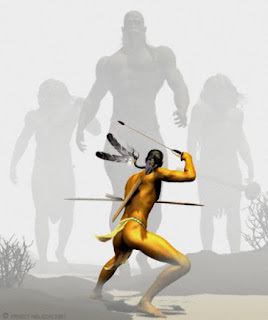 Their first meeting with the Tehuelches was recorded by Antonio Pigafetta: “One day, when no one was expecting it, we saw a giant, completely naked, by the sea. He danced and jumped and singing, spread sand and dust over his head. He was truly well built … The captain named these kind of people Pataghoni. They have no houses but huts, like the Egyptians. They live on raw meat and eat a kind of sweet root which they call capac. The two giants we had on board ship ate their way through a large basket of biscuits, and ate rats without skinning them. They drank a half bucket of water at once." In around 1542, within months of De Soto and Coronado's expeditions, 5 year old Fray Diego Duran moved with his Christian missionary family to central Mexico and spent most of his life there. 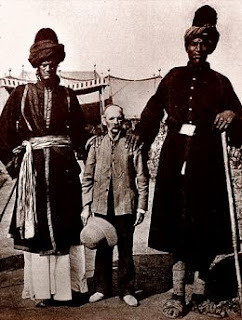 During his travels, he recorded several times coming in contact with giant Indians: "It cannot be denied that there have been giants in this country. I can affirm this as an eyewitness, for I have met men of monstrous stature here. I believe that there are many in Mexico who will remember, as I do, a giant Indian who appeared in a procession of the feast of Corpus Christi. He appeared dressed in yellow silk and a halberd at his shoulder and a helmet on his head. And he was all of three feet taller than the others." 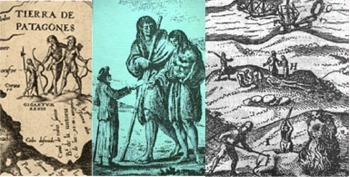 In his book "History of the Indies," Joseph de Acosta also tells a tale similar to Duran's: "When I was in Mexico, in the year of our Lord one thousand five hundred eighty six, they found one of those giants buried in one of our farms, which we call Jesus del Monte, of whom they brought a tooth to be seen, which (without augmenting) was as big as the fist of a man; and, according to this, all the rest was proportionable, which I saw and admired at his deformed greatness." Halfway around the world, in 1575 when the Tartars invaded Poland, Jacobus Niezabilo-vius defeated a soldier of gigantic size who fought within their ranks. After the battle, The Polish army recorded that: "his body was of so prodigious a bulk that ... his carcass reached to the navel of any ordinary person standing by the side of it." 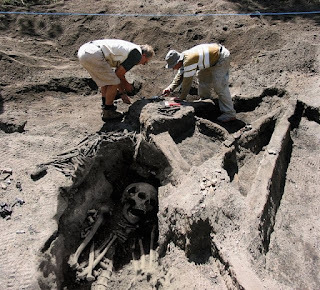 Throughout history and all over the world hundreds of giant skeletons have been discovered, unearthed, recorded, and in recent times photographed and preserved for posterity. Thanks to suppression and censorship by the Smithsonian and other establishment organizations, however, most people are completely unaware of these amazing discoveries. In 1456 a 23 foot tall human skeleton was reported and removed from beside a river in Valence, France. In 1577 a 19 and a half foot giant skeleton was found under an overturned oak tree in the Canton of Lucerne. In 1613 a giant skeleton was found near Chaumont castle in France and reported to be 25 feet, 6 inches tall! 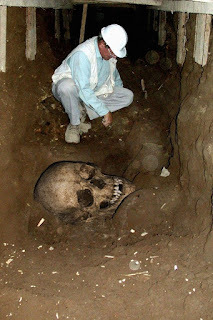 In 1829 the Burlington News reported on workers digging into a mound being used to furnish building material for a new hotel in Chesterville, Ohio when they dug up a giant human skeleton. 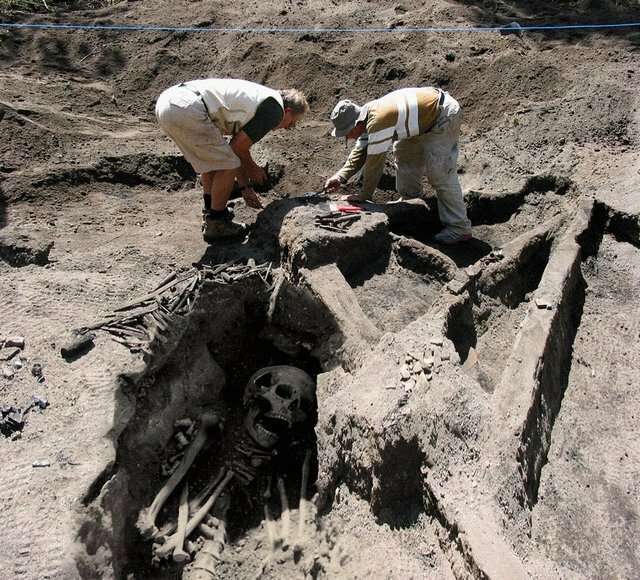 In 1833 soldiers digging at Lompock Rancho, California discovered a giant male skeleton 12 feet tall with double rows of teeth surrounded by giant weapons. In July 1877 four prospectors in Eureka, Nevada found and chipped out several human leg and foot bones encased in solid quartzite. One of the leg bones from heel to knee was 39 inches long, twice the size of a modern day adult human. 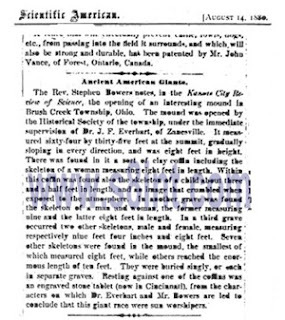 In 1879 the Indianapolis News reported that a 9 foot, 8 inch skeleton was excavated from a mound near Brewersville, Indiana. 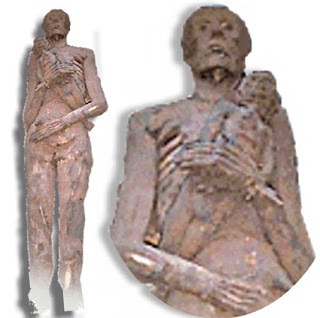 In 1891 workmen excavating near Crittenden, Arizona discovered a huge stone sarcophagus eight feet below the surface which contained the mummified body of a 12 foot tall giant with 6 digits on each limb. The Chicago Record reported on October 24, 1895 that a mound near Toledo, Ohia was found to hold 20 skeletons, seated and facing east with jaws and teeth twice as large as those of present day people, and beside each sat large bowls with curiously wrought hieroglyphic figures. 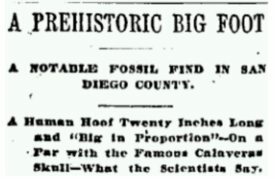 In December 1895, a 12 foot 2 inch fossilized Irish giant was found by a Mr. Dyer while prospecting for iron ore in Antrim County, Ireland. Strand magazine featured a picture of the giant at a London rail depot. It weighed 2 tons, had 6-digit limbs, and was exhibited in Dublin, Liverpool and Manchester for sixpence a person “attracting scientific men as well as gaping sightseers.” After a legal dispute regarding ownership, however, the exhibit disappeared from public display forever. 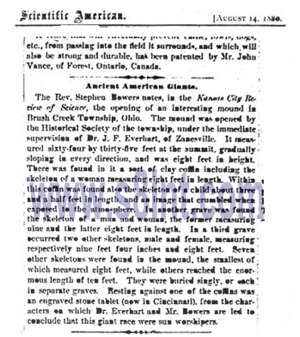 18 giant human skeletons were found in mounds next to Lake Delavan, Wisconsin in May of 1912. 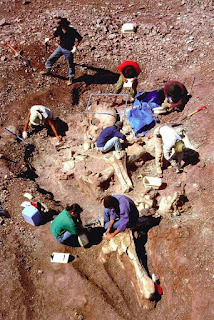 Beloit College professors and students excavated the site uncovering giants from 7.6 feet up to 10 feet tall with double rows of teeth and 24 digits. The Washington Post on June 22, 1925 and the New York Herald-Tribune, June 21, 1925 reported that “a mining party found skeletons measuring 10 to 12 feet with feet 18 to 20 inches long, near Sisoquiche, Mexico.” The Los Angeles Times on October 2, 1927 reported “explorers in Mexico located large human bones near Tapextla, indicating a race of gigantic size.” The “Review-Minter” of June 19, 1931 reported on two giant skeletons found in Lovelock Cave, Nevada. Both were wrapped in a gum treated fabric, one 8 and a half feet tall, the other just under 10 feet tall. 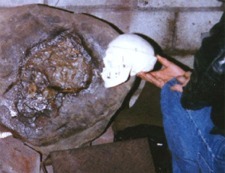 A giant skull and jawbone from this discovery are still on display at the Humboldt Museum in Nevada. In the late 1950s, during road construction in south-east Turkey many tombs containing the remains of giants upwards of 16 feet tall were uncovered. 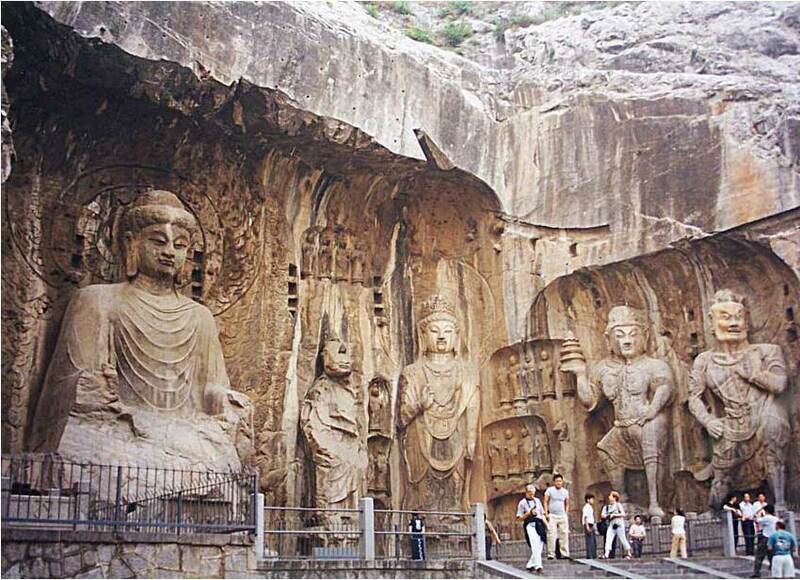 Leg bones were measured to be about 120 cms or 47.24 inches. Note how these many giant discoveries are made by a wide range of people with a variety of jobs and interests, unlike supposed “dinosaur” discoveries which are always made by highly invested-parties. Also note how the Smithsonian has entire museums filled with fake dinosaur skeletons, yet has never displayed a single giant human skeleton; even though they are in possession of several of them, they maintain that giants never existed and have never been discovered! When Spiro Mound in Oklahoma was excavated in the 1930s, an eight foot tall giant in full armor was discovered along with a treasure of pearls and other jewels. The Smithsonian Institute was directly involved in the cover-up of this and many other ancient mounds of the Midwest which were dug up. Archaeologist / Researcher David Hatcher Childress reported on one Smithsonian employee who lost his job for exposing evidence that the Smithsonian had at least once taken a barge full of unusual artifacts out and dumped them in the middle of the Atlantic Ocean! Hello. 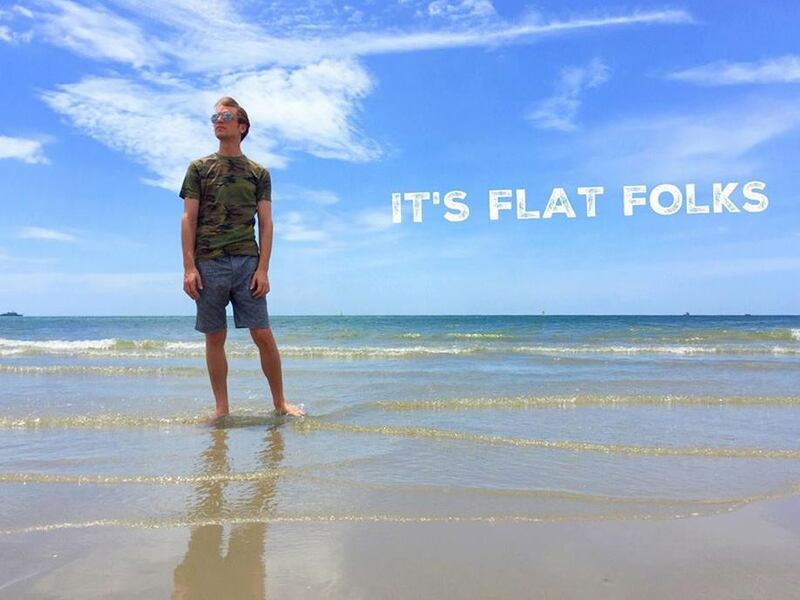 My name is Eric Dubay and I'm a Flat Earther. Contrary to what you have been told to believe about me by the mainstream media, the government education system, and society in general, I am not an idiot, uneducated, or a religious zealot. I am a college graduate, spent 7 years teaching at a prestigious University, have published 5 books, and am not a follower of any religion. 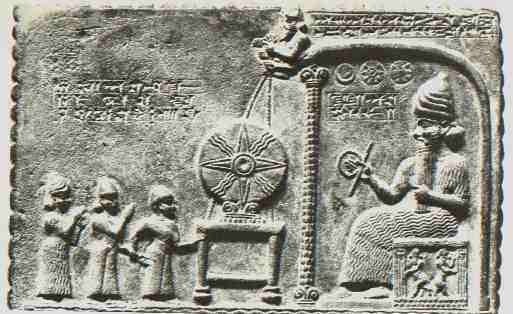 I was once a spinning ball Earth believer like yourself. In fact, the only difference between Spinning Ball Earthers and Flat Earthers, is that Flat Earthers have done their research. Of course, however, you will be told the opposite, that Flat Earthers are uneducated morons unaware of modern scientific theories, but the reality is every Flat Earther is well educated regarding the Spinning Ball Earth fantasy presented by NASA, taught in schools, and accepted as gospel truth by the gullible masses. In fact, you will find the average Flat Earther is far more knowledgeable about the Spinning Ball Earth we're supposedly living on than the average Spinning Ball Earth believer! This is because Flat Earthers are all people who attempted to prove for themselves whether or not Earth is the way modern scientific and astronomical theory preaches, and discovered that it most certainly is not. There are hundreds of proofs and scientific experiments which have conclusively shown the Earth to be a stationary plane, but you have never and will never hear about these heavily censored experiments in our controlled media. You never hear of the Michelson-Morley, Michelson-Gale, Sagnac, Kantor, and Airy experiments, for example, all of which proved the Earth to be motionless. You also never hear of the Rowbotham, Blount, or Carpenter experiments all of which proved the Earth to be a level plane devoid of any curvature. 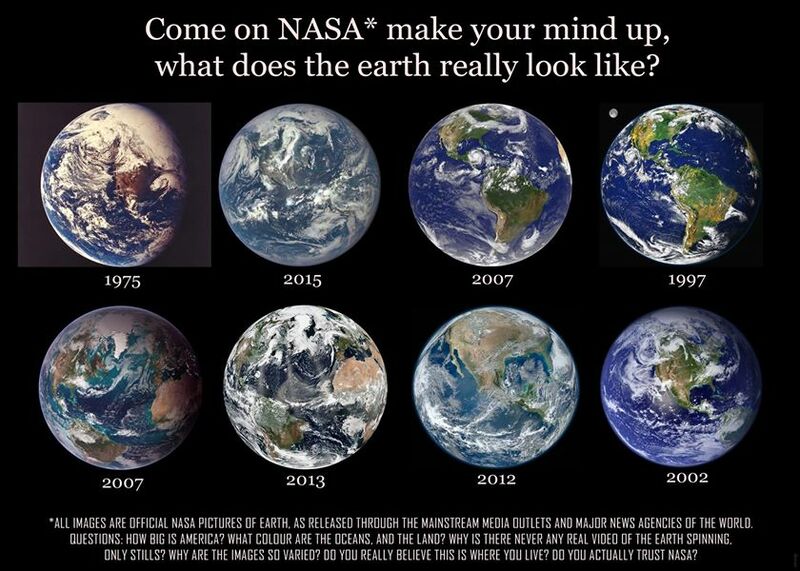 Instead you are repeatedly shown NASA images of a spinning ball Earth and astronauts in zero-G space. You are told the oceans curve around and stick to the underside of a spinning ball thanks to Newton's magical gravity. You are told Eratosthenes measured shadows to prove the ball, and Magellan circumnavigated the ball. Again, us Flat Earthers are well aware of the supposed proofs and alleged evidence we are given regarding the spinning ball Earth fantasy. The difference is we have further analyzed these supposed proofs and found glaring holes in them even larger than the size of NASA's annual budget. I have personally debunked every such claim of supposed spinning ball Earth evidence I could find in my book "The Flat Earth Conspiracy," and also compiled "200 Proofs Earth is Not a Spinning Ball" in my book of the same title. I will not re-iterate myself here as you can read these online for free now in over a dozen languages, but suffice to say, there is no aspect of the spinning globe model that stands up to critical scrutiny, and every alleged proof offered is easily refuted. The spinning globe and every argument used to defend it is simply pseudo-science masquerading as truth. The pictures and videos presented to the public by NASA and other government space agencies are as real as a Hollywood motion picture and as scientific as science-fiction. Science facts, on the other hand, prove the flat Earth. For example, it is the natural physics of all fluids to remain perfectly level and flat until disturbed in some way. If dammed up and released, all liquids will quickly disperse in every unobstructed direction until finding their new level. This ever-present, never-broken law of physics is so reliable that builders use water spirit-levels to level all their constructions. 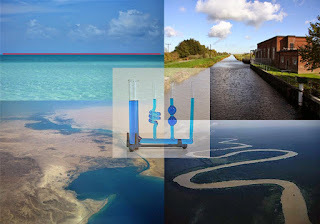 When you look out at the sea-horizon, from as high as amateur balloons and rockets have ever gone, the water line always remains completely level and flat. If, however, the Earth is a spinning ball as NASA and modern astronomy claim, then somehow the massive oceans must all in defiance of physics, curve thousands of miles around an irregular pear-shaped oblate spheroid. In reality, measurements have been repeatedly taken throughout history until modern times using lasers, levels, sextants and theodolites to test for Earth's supposed curvature and every time have proven what our eyes and experience tell us to be true: The Earth simply does not curve downwards 8 inches per mile squared as dictated by spherical trigonometry and NASA's own calculations for a globe Earth 24,900 miles in equatorial circumference. This mythical curvature exists only in the fisheye lens footage they constantly film and the fake CG images of Earth they constantly propagate. Now, dear Spinning Ball Earth believer, there is much more you must learn and even more that you must unlearn to understand fully the depth of this deception. It will take more than just a few minutes of Flat Earth research to overcome a lifetime of indoctrination, but I implore you to do just that. 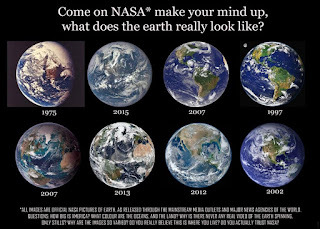 Try and prove to yourself whether or not the spinning ball Earth we are taught to believe since kindergarten is in fact a reality. I can speak on behalf of every Flat Earther when I say that's exactly what we did. We did our due diligence in researching and proving one way or the other whether this seemingly flat, motionless plane we all stand upon is actually a tilting, wobbling, rotating and revolving pear-shaped oblate spheroid, hurdling around the Sun, or whether everything is actually just as it seems: Water always remains level and flat, the horizon always remains level and flat, the Earth is motionless, just as it seems, and the Sun, Moon and stars all revolve over and around us, just as it appears. I encourage you to please explore this fascinating subject for yourself by viewing the many other Flat Earth documentaries and interviews on my YouTube channel and visiting The International Flat Earth Research Society at IFERS.123.st Thank you!